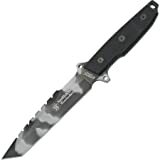 The Rothco Smith and Wesson Homeland Security Survival Knife is a large Urban Survival Knife from Smith and Wesson. As the “Urban” designation suggests, this knife is designed differently from a forest survival knife. The large tanto blade, urban camo paint job, and large non-functional serrations on the back of the blade add to the urban effect. The tanto blade shape was a good choice for this knife. Tanto blades are great for stabbing and piercing attacks. In an urban survival situation I could see myself having to drive this knife through all sorts of things like drywall, sheet metal, or even an assailant so I really like the extra tip strength the tanto blade provides. The 8″ long 440C high stainless steel blade is<--!more--> plenty big and it has a titanium nitride coating for added durability. This is a large and solidly built knife and it feels nice and heavy in the hand. What I really like about this knife is the balance. It slightly favors the blade which makes it perfect for chopping survival tasks. I could see myself busting up pallets for a fire or hacking a door down with this knife. The S&W Homeland Security comes with 5 3/4″ handle. The handle scales are made of a textured G10 and are bolted on to the knife in 3 positions. The G10 offers nice grip and the shape of the handle feels good in the hand. Something I really like about this handle is S&W’s inclusion of three lanyard holes. This is important if you are going to do any kind of heavy chopping. Also, you can lash this knife to the end o a pole to make a spear. The Homeland Securty comes with a decent cordura sheath. This isn’t the best sheath in town but it will get the job done. It is pretty simple sheath with belt loop and a velcro strap for the handle. It has good blade retention and provides ambidextrous access. As an added bonus the outside pouch comes with a diamond coated sharpening stone. You can use the stone or replace it with a firestarter or whatever other survival gear you find necessary. I agree with the hacking ability and shear cutting power of this knife. The steel is very thick which makes this thing chop like a tomahawk. While the blade length makes this a great tool it severely limits the ability of the user to carry it. I ended up with it strapped on the exterior of my pack because it wouldn’t fit anywhere else. Unfortunately by doing so I opened myself to more “Where you going Rambo?” comments than I had creative answers for. As long as this knife is made of 440C, I’m a huge fan. If they start making it from 7CR17, like their other knives, I’m outta here. I’ve really gotten to hate 440A (and Chinese 7CR17 is 440A). Only Cold Steel ever hear treated it well. I have a number of 440A knives not made by Cold Steel, and they’re impossible to sharpen. So get this big bruiser in 440C. It’s a steal for $36!